A forest or mountain cabin, or a lake cabin, is something a lot of us think about, whether it would be our main place to live or a second house, like a country house to get away from the hustle and bustle of town/city paces, or even a vacation home. Some people even consider them in order to rent them out, like a rental cabin (and there are a lot of rental cabins out there, and they don’t seem to be all that cheap to rent, either). 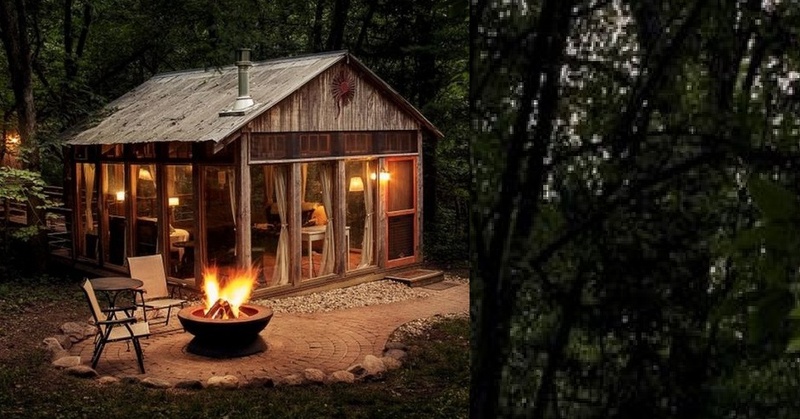 This particular cabin is set in the woods of Wisconsin. It’s called “Glass House” by its owners. This rustic cabin, though, is not to be confused with the decidedly not rustic “glass house” featured in the film by the same name or a number of other glass houses that are actually mostly glass (I mean, all the walls are pretty much big panes of glass supported by metal columns and beams). The construction of this secluded cabin would place it along the price lines of a frefab modular home or cheap log cabin. It’s just a square timberframe construction with a two-pitched roof and a chimney. Instead of plywood siding and insulation broken by a couple of windows, they have opted for no plywood siding at all, and instead glass walls between the beams. They cleared the ground and bordered it with rocks and put a fire pit in with a couple of chairs, and that looks like the outhouse back behind the wood cabin that is connected by a bridge. An idea of how something simple can be a place to relax and a place to go and think about going, this rustic cabin.